As Andy Murray's retirement moves a step closer following his defeat by Roberto Bautista Agut in the Australian Open, the tennis star remains poised to continue making as big an impact off court as he did on it. With a burgeoning range of business interests the Scot - never one to shirk speaking his mind - has the power to remain vividly in the public consciousness whichever route he chooses to go down. His career prize money ranks fourth all-time among male players, behind his three eternal rivals from the so-called "Big Four" players of his generation - namely Roger Federer, Novak Djokovic and Rafael Nadal. According to US business bible Forbes, Murray will end his playing days with at least $165m (£129m) in career earnings, with prize money making up just $61m, and the bulk - some $100m - coming from endorsements, bonuses and appearance fees. And Murray's rough-round-the-edges personality is an asset which industry observers believe he can continue to use as a means of generating income when he hangs up his racquet. "He is definitely different from the other top players," says brands expert Anastasia Kourovskaia, who has followed the 31-year-old's tennis and commercial career closely. "He has already created a strong legacy, one that has enabled him to keep his brand presence alive when he was fighting injury over the past 18 months. "The authenticity of his personality is his main asset. A lot of people are changed by success, but he is consistent. It is a fantastic quality from a marketing point of view." She says while he will not reach the same earnings level in retirement, there will still be companies looking to be associated with the three-time Grand Slam winner. Ms Kourovskaia says: "He has a great opportunity for leveraging his brand name when he stops playing, but in a way that suits his personality. "He will not be a David Beckham of British tennis, nor a Roger Federer - he will never be a global icon as they are. He has always been an 'outsider', whose success has been greatly assisted by his grit and doggedness. "From a marketing view he occupies a very tight niche - as long as he retains the same qualities and does not look to acquire a more glamorous image." 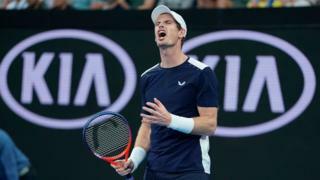 Murray's exit at the 2019 Australian Open in Melbourne, an event which could become the swansong of his career, saw him wearing British sportswear brand Castore. The Scot's new sponsorship emerged over the weekend, where he held a teary news conference - wearing Castore's Johansson T-shirt and Ghost Cap - stating that he would be retiring from tennis this year after struggling with a hip injury. "He needs to choose brands that highlight him as an outsider, which is why the Castore deal was bang on," says Ms Kourovskaia. "He will be worth much more to a niche brand seeking to make, or build, exposure. "Castore is a British brand which has a high priority in widening its exposure, which is why it is a perfect deal for both parties," she says. He has in the past said that "giving recognition and support to British entrepreneurs is important to me". Simon Chadwick, professor of sports enterprise at Salford Business School, says: "While these investments may be a small proportion of his total income, and while they also may provide a potential future revenue stream, I see them as being part of an overall strategy to market Murray as a 'people's man' after his playing career. "He is good with kids, and he is an enlightened commentator on things like gender issues, so I see these investments in start-ups, including ones to make tennis more accessible, as part of his brand positioning." Also in 2013 he set up his sports management agency, 77, with business advisers Matt Gentry and Gawain Davies and has signed up a number of young athletes, among them Aidan McHugh and Katie Swan from the emerging pool of young British tennis talent. "He has already inspired the current generation of emerging British tennis players, so in some ways this sporting legacy is in place already," says Ms Kourovskaia. "But opening his own academy is definitely something he should consider, as it could only benefit him as a brand, and ultimately the country if new British players came through from it." Meanwhile, she says should the father of two girls - who has a dry sense of humour and has supported causes such as women's rights and Scottish independence in the past - go down a media or political route then his forthright outlook is an asset. "People like him for this, and it does not raise eyebrows as it might in, say, someone like Nadal. His strong convictions and strong views are also qualities that can be leveraged for him as a brand."